This is a risk of “traditional” divorce that doesn’t come up often. Traditional divorce doesn’t teach you to communicate with your ex spouse, but rather to have an adversarial relationship, where non-communication becomes the norm. If you think that’s fine, think about the following situation, involving two parents, two sets of lawyers, and one wise old judge. The custodial parent moves and enrolls their child in a new school, but fails to communicate the details with the other parent, who comes to believe that the child would be walking home along dangerous, busy streets and coming home to an empty house. That parent files a temporary restraining order to prohibit the enrollment. The truth is that the custodial parent had in fact taken all concerns into account, and the child was at no risk. The non-custodial parent based their fears on hearsay, and the restraining order had no merit – so, after reviewing the evidence and the custodial agreement, the judge threw it out. But, and this is a big one, he didn’t grant attorney’s fees to the custodial parent. Why not? The restraining order had no merit, after all. The judge decided that court was a poor substitute for a simple conversation. In effect, he punished the custodial parent, who was acting within their rights, for not pro-actively communicating with the other parent. Mediation or collaborative divorce can help avoid expensive and wasteful litigation not just at the time of the divorce, but years down the road. On October 18th, The Law Collaborative is offering Tips, Tricks & Strategies for Divorce, a seminar that will provide tools for moving a stuck case forward, how to communicate effectively with a former spouse, tricks for negotiating even when negotiation seems impossible, and more. The workshop is $25 in advance or $35 at the door. Licensed attorneys who attend will earn 1 MCLE credit. Anyone contemplating or going through a divorce is invited to attend. 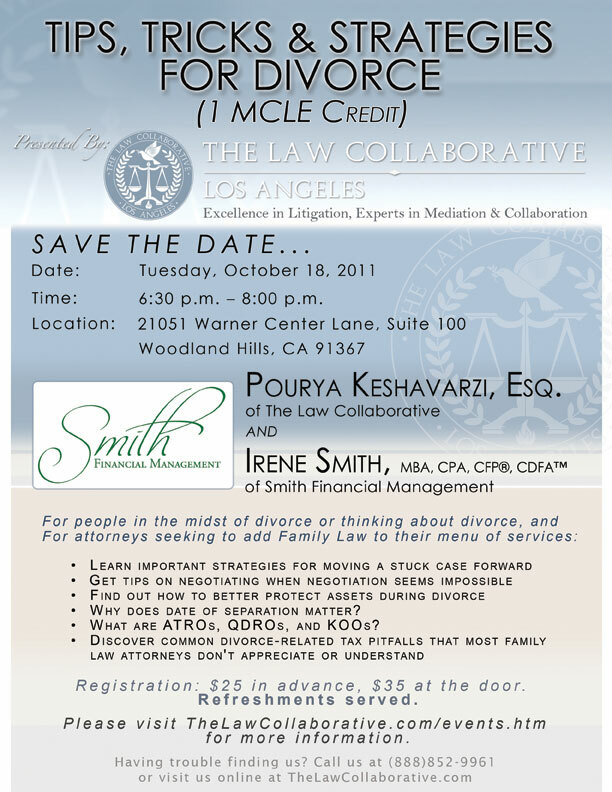 Register online at www.thelawcollaborative.com or call us toll free at (888) 852-9961.